Usually when I tell people that I am planning on doing a 24 hour race the first question they ask “Are you going to ride the entire time?” I usually reply “that is the goal”, but their second question is either “are you crazy” or “what do you eat?” We already know the answer to one of those…yes…so I thought I would share my nutritional strategy that has served me well over the last few years of endurance racing. I am by no means a nutritionist or expert, however my wife and I have been going the distance since 2012 and I have learned a few things along the way. The most certain thing I’ve learned is that nutritional plans are personal and can vary widely so I plan on giving a top-level plan while throwing in bits that have or haven’t worked well for me. I’ve read that most athletes can intake 200-300 calories per hour at an endurance pace. Some people can go above that, but not me. I aim for the 250-275 cal/hr mark when racing. This is an important metric to find. If you aim too low on the scale you won’t be able to replenish your glycogen stores fast enough and you’ll hit the dreaded wall. 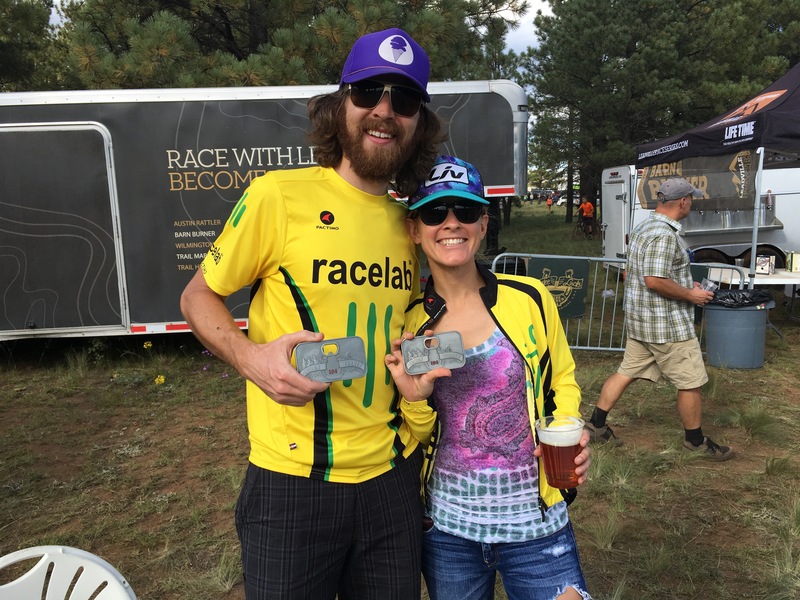 Ideally, you’ve adapted your body to burn fat for endurance racing (a good coach can help with that and Racelab’s coaching has years of success in this arena), but even the best endurance athletes still use glycogen and need to restock the tank to avoid bonking. If you aim too high on the scale you will end up with gastrointestinal (GI) distress. Your gut can only process so much and if you try to force it to do more things usually don’t go well. In order to digest more, it requires more blood flow which is diverted away from your muscles that ultimately need the oxygen rich blood. On the extreme end you will get a backlog of calories sitting in your stomach and if it gets bad enough your body will pull in water to your gut from your muscles to flush the blockage…not pleasant. This limit is found over time during those long training rides and races. In parallel to Step 1 it’s important to find what products you like and work well with your stomach. Do you prefer solid food, or do you prefer drink mixes with calories? Those long training rides are great to experiment and find what works. Be sure to find a variety of things that both you and your stomach enjoy. One of my first endurance races I only took one flavor of GU to take every half hour. Mid-way through the race I couldn’t stand the thought of eating another one, it was a miserable experience, even though my stomach had no issues. Thankfully that was a relatively short race. And don’t be shy about trying real foods. I found I enjoy a mix of real food in addition to the sports specific drink mixes and gels like CarboRocket, HumaGels, and others especially for really long races. When looking at foods from the market aim for high glycemic index foods like rice, potatoes, raisins and even bacon. Protein sources should be kept to a minimal, although the really long races a bit of protein can help, but don’t overdo it on the bacon. The high glycemic foods are much easier on your body to convert to sugars and to replenish your glycogen stores. Things I personally like to eat include ProBars, Fig Newtons, Nutter Butters, and blueberry rice cakes from Skratch Labs. These all work well with my gut and help keep the engine going. I’ve heard it said garbage in equals garbage out so be sure to watch what you eat and try to eat clean. I don’t follow that as well as I should, but for nutrition during racing I do pay closer attention, especially since I learned the hard way. I’ve always been told that electrolytes are important so I started using First Endurance EFS drink mix. I chose it for the higher calorie content but also for its high electrolyte content. I figured more is better so why not. All my longer training rides went well using it, but my longest ride was around 6 hours. When I did my first 10 hour race I used EFS primarily and things went well, till right after the race when I was running to the port-o-john. After some research, I found out the high magnesium levels in the mix can act like a laxative. Not a pleasant experience but it taught me to do my research and pay attention to what and how much I consume during races…more isn’t always better when it comes to electrolytes. So it’s important to understand what ingredients are in products and how they can impact your performance. Having a plan is important when it comes to racing. Proper nutrition strategy will play a big role in your results. I try to simplify the plan as much as possible. For lap based races I break it down to what I need to consume per lap. For 24 hours in the Old Pueblo I kept it very simple with one bottle of CarboRocket and one pre-packaged snack bag of food (cookies, gel, rice cake, etc). Not only is it simple it allows you to easily track your consumption and if you are diverting from the plan. For races with one big loop or point-to-point style races it’s a bit more difficult to keep it simple. For these style races I recommend setting pre-planned nutritional goals between the aid stations, like 2 bottles between aid station 1 & 2. These races take a bit more mental effort to track your progress, so I usually tape the aid station mileage marker notes to my bars. I also tend to carry a few extra calories with me just in case my pace falls off the mark. If the race allows it drop bag services can really help, use them. Having a good plan is important,but it’s more important to be able to adapt when needed. Don’t be so chained to your plan that you stick to it no matter what, even if your race has changed. What if the race day temperatures are going to be high? It would be wise to back off the calorie consumption rate a bit. Because more bloodflow is required for maintaining your body temperature which leaves less resources for your digestive system to function properly. Racing is also unpredictable so you need to be prepared to handle nutritional changes based on your effort. If the pace is higher than you expected be sure to dial back your intake. Cramming in the same number of calories in a shorter time you may overload your stomach and cause GI issues. Learning how to adjust takes time and experience. If something didn’t work out quite right make a note of it and readjust the plan you made in Step 4. I am always adjusting and trying new things and keeping the things that work. Water only with a gel or two to provide some quick sugar. You should enter the race properly hydrated and fueled and you should only require minimal calories during the race to get you to the finish. ~250 calories per hour from liquid nutrition, no solid food. I prefer CarboRocket Half Evil (especially the Black Cherry flavor…try it just trust me). ~100 calories per hour from solid food (cookies, rice cakes, ProBars, etc). I like to add in solid food during the long races for variety as well as a small source of protein (but not too much). Did Not Finish…I cringe just typing those words. Writing this race report stings and hurts, and it’s definitely not the one I wish I were writing. Last year my goal was to finish and surprisingly I finished in second place so I knew right away that I would be back to really compete…to continue to push my body to its limits. I picked up my training and focus for the entire next year in preparation for this year’s race. All efforts were aimed to finish the 24 Hours to the best of my ability. And for 20 hours of the race it was all coming together until an aggressive pass from a fellow rider sent us both down, and I stayed down…DNF. Whether it’s a team race or one we both complete individually it continues to amaze me how we always have such a different experience. Below is a quick report from Danielle and me on how the day played out.